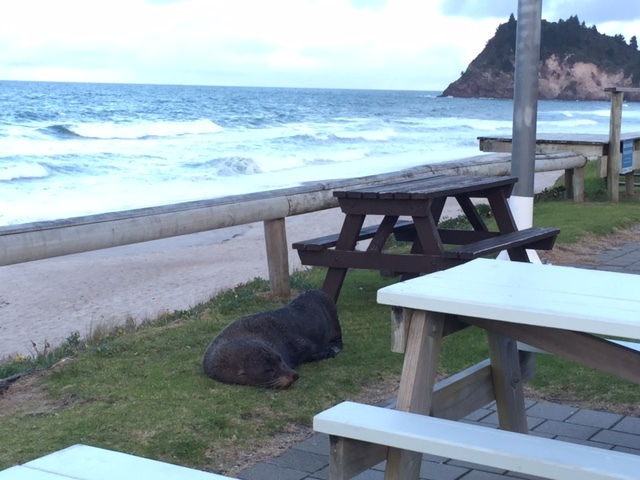 A visiting dignitary was having a snooze on Monday at the Whiritoa Surf Club. Unfortunately the club garden bar was closed and it failed to get the message. Not phased by this it decided to hang around anyway and catch-up on some much needed rest before continuing on its journey. Seal sightings have been quite topical lately with two making the news in Auckland last week. An indication of cooler waters heading north as winter sets in. Thanks to Ross and Gail McCullough for sending in the pic. ← Don’t forget – The 2015 Mid Winter Swim is on this weekend!